I have had my 2 brothers since the last weekend of February. sounds like your bonding is going well at least with one. 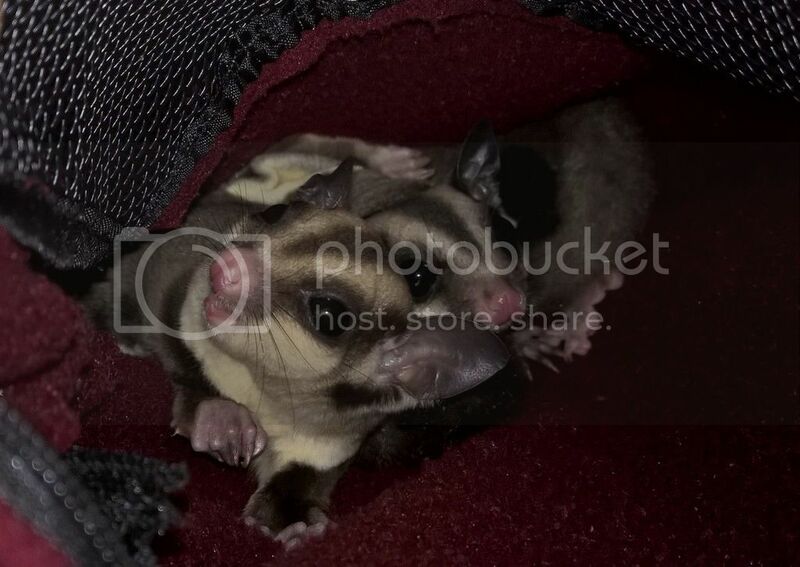 I have a shy one too and during tent time would rather stay in the pouch too. I've tried several different ways to get her out and the best one so far is to make the pouch shorter by rolling down the sides, so they are less hisden. It takes awhile but mine will eventually come out and join the fun if only for a bit at first. Treats will also lure them out. Welcome! It sounds like things are going well Congrats on joining the madness & how to hear more about your boys soon! My two are very different as well. I have one bold adventurous boy who can't wait to explore everything, and one extra-cautious timid girl who takes a while to warm up. Looking forward to seeing your pics, whenever you can manage to take some! Ok no idea what is up with them today, that full moon thing real? Full moon can affect their mood and mine occasionally sleep separate. Mine have gone wild at the full moon before, but it doesn't seem to happen every month. Welcome to the suggie world Something you might want to start on right away is training them to recognize the sound of incoming treats. Mine will come out when i ring the bars with a fingernail, or when i shake the bag of worms. Once they know the sound of yummies, its much easier to get them under control when they inevitably escape and terrorize the house or find them when they are hiding out in the playroom. Hmm i give up, only 1 picture at a time ? Last edited by SugDad; 03/20/17 04:31 PM. I use the Photobucket method so I may imbedd them. What, no proper introduction? What's the name of this cutie pie?